Jefferson James Wilkes contacted me back in the early 2000s and we arranged to have lunch and taste his J. Wilkes Pinot Noir wines. His wines from Bien Nacido Vineyard were a revelation, offering elegance and refinement instead of extraction and power so prevalent in California Pinot Noir wines of the time. We became friends and I continued to sample his wines until his untimely passing. Besides an enthusiasm for Pinot Noir, James was a proponent of Pinot Blanc, an under-appreciated mutation of Pinot Noir. 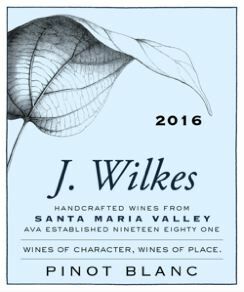 Currently, the J. Wilkes brand legacy has been revived by winemaker Wes Hagen, formerly of Close Pepe Estate Wines, who moved on in 2015 when the Clos Pepe Vineyard was leased to WALT Winery and became the winemaker and enthusiastic brand ambassador for J. Wilkes Wines based in Santa Maria. The Miller family owns Bien Nacido Vineyards, encompassing Bien Nacido and Solomon Hills vineyards, as well as J. Wilkes Wines. Estate wines from Bien Nacido and Solomon Hills vineyards are produced as distinctive vineyard-designated offerings, and grapes from both vineyards are sold to many exalted California wine producers. J. Wilkes Wines is a separate brand, specializing in AVA-designated wines. I asked Wes to look back and share his knowledge of the history of J. Wilkes Wines and his recollections of Jeff, and look forward in discussing his goals in continuing the J. Wilkes legacy. Wes is not only an accomplished winemaker and an industry leader in Santa Barbara wine, but he is also an accomplished wine writer, researcher and lecturer. He has talked on the history of wine in general and Santa Barbara wine in particular at many prestigious institutions and his writing has appeared in many prominent wine publications. He also had an instrumental role in the approval of the last three AVAs in Santa Barbara County: Sta. Rita Hills, Happy Canyon and Ballard Canyon. In his own words, this is what Wes had to say. I first had a proper wine conversation with Jeff Wilkes in 2005 when I was making wine for Clos Pepe Estate Wines at Central Coast Wine Services (CCWS) in Santa Maria, the same facility where he made his J. Wilkes Wines. I had met Jeff a few times at wine industry events, and we had chatted politely, but that day in 2005 was a bottling day, so we struck up a conversation about one of Jeff’s great passions: Pinot Blanc. We talked to the tank where his 2005 Pinot Blanc was waiting to be bottled. We retrieved a few glasses from the lab and walked over to the stainless tank and Jeff pulled us a few samples. The wine smelled of fresh nectarines and peach flesh, supported by a surprisingly nervy acidity and Old World saline minerality. Here, finally, was a wine that reflected pure Santa Maria typicality, but was also a homage to the land where Pinot Blanc expresses itself at the highest level (with apologies to the Alto Adige). We have all tasted seminal wines that changed us, and Jeff’s 2005 Pinot Blanc was one of those wines for me. Our ‘meeting of the minds and palates’ was a strong foreshadowing of a future I wasn’t expecting. That I would be the winemaker at J. Wilkes a decade later never entered my mind. 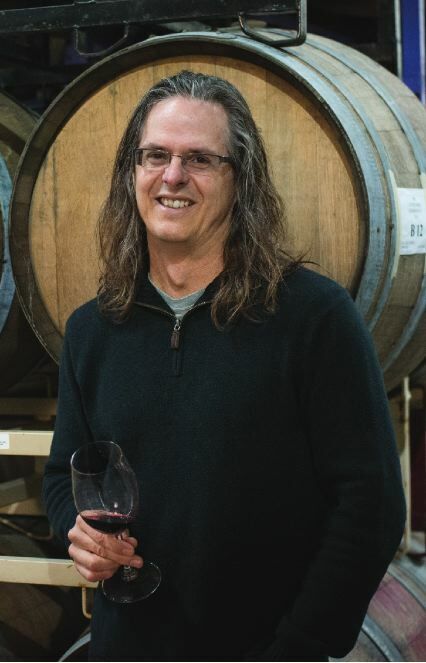 Now in my fourth vintage as the winemaker at J. Wilkes (2015-2018), I never want to lose sight of Jeff’s history in establishing the brand and his goals as a winemaker. The Miller Family of Santa Barbara County (Steve, Ladeen, Marshall, Nicholas and their families) has been farming fruit on the Central Coast since 1981. In 1969, the year I was born, they had purchased much of the Rancho Tepusquet and an adjacent parcel in order to plant grapes. Their first vineyard was planted in 1973 and was called ‘Bien Nacido’ after the planting crew’s insistence that it was a ‘well-born’ vineyard because it used some of the first metal trellis materials installed on the Central Coast. About ten years after the vineyard was planted, the Millers needed someone to promote and sell the fruit from Bien Nacido Vineyard, as a glut of wine grapes was impacting price per ton, making a difficult business even harder. By this time, Jeff was a fixture on Bobby Miller’s ‘Free Run’ boat in the Santa Barbara harbor, and Bobby recognized Jeff’s commitment. Bobby hoped that this dedication would transfer to grape sales and promotion. There is a great story that the last contract for grapes that Jeff ever sold was to himself in order to start making wines under his own J. Wilkes label. The story goes that he signed his own contract and then gave his notice to the Miller family. He was then offered the opportunity to make his J. Wilkes wines at Central Coast Wine Services, owned by the Miller family. The Millers and Jeff would be linked for Jeff's entire wine career. 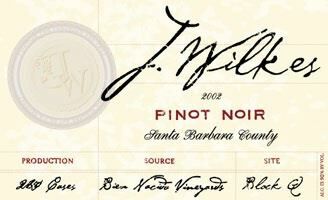 By the 2013 vintage, the J. Wilkes wines were well-received critically and were featured at venues such as Emeril’s flagship restaurant in New Orleans, SommCon, AWS National Conference, the State Department lunches and dinners, White House Guest House (Blair House), Cornell University and CalTech. Vidal continued making the J. Wilkes wines in 2014 while I was making my last wines at Clos Pepe Vineyards and Estate Wines in the Santa Rita Hills. In 2015, I made my exit from Clos Pepe public after 21 years. I was approached by Nicholas Miller at a conference to see if I would be interested in a winemaking job. By harvest of 2015, I moved my wife Chanda to a house in Santa Maria and was on board as the Consulting Winemaker and Brand Ambassador for J. Wilkes Wines. My experience as a winemaker at Clos Pepe for 16 vintages gave me expertise in producing cool-climate Burgundian varietals such as Pinot Noir and Chardonnay, and my experiences making aromatic white varietals such as Grenache Blanc (and my conversation about Pinot Blanc with Jeff a decade earlier) enabled me to have immediate success with Pinot Blanc that we continue to create and bottle. Santa Rita Hills AVA Pinot Noir was added to the J. Wilkes portfolio beginning with the 2013 vintage and released in 2015. This opportunity allowed me to use my knowledge of this area to blend a 250 case offering. In 2014, we added Paso Robles Highlands District AVA to the lineup. So far we have produced a broad market offering of Cabernet Sauvignon (the first 2014 vintage garnering 93 points) and smaller productions of Zinfandel and Lagrein from this AVA for our wine club and special accounts. The future of the J. Wilkes label is bright. The case production has nearly tripled since I came on board, and we are cementing a national footprint for J. Wilkes to be a “Wine of Place,” representing elite vineyards from a specific AVA blended together. We currently blend the best vineyards in three AVAs: Santa Maria Valley, Santa Rita Hills and Paso Robles Highlands District. My greatest hope is that Jeff would enjoy the wines our team produces, and find them a solid reflection of the wines he loved to drink and make. Please raise a glass of Pinot Noir or Pinot Blanc to the legacy of Jeff Wilkes tonight and maybe even spill a drop into the Pacific Ocean in his memory. I think Jeff would be pleased that to this day, Pinot Blanc is our top selling wine in the United States and beyond. For those who never met Jeff, I offer a short video of him with his barrels at CCWS (thanks to Lee Tomkow): www.youtube.com/watch?v=jUOnrggLf6k. Wes offers private and semi-private wine tasting on occasions for wine club and committed enthusiasts (see website). A tasting room is planned for opening in late fall 2018. J. Wilkes wines are available from the winery website at www.jwilkes.com as well as through retail distribution. These are among the best wine values currently in California. Pinot Blanc is a white grape genetic mutation of Pinot Noir. Research has indicated that this mutation of Pinot Noir arose independently from the ancestral Pinot Noir, suggesting a novel parallel evolutionary model. Pinot Blanc is fairly widely planted worldwide, but has never received the attention accorded other major white varieties. Stateside, the most plantings are in the Willamette Valley of Oregon where it has not achieved the notoriety of Pinot Gris. That said, I have had a number of exemplary Pinot Blancs from that region. Many examples of Pinot Blanc are driven by subtlety, sometimes to the point of blandness, giving the wine a bad rap. It probably has garnered its most notoriety from examples grown in northern Italy and Alsace. Its flavor profile mimics Chardonnay, but is lighter and less assertive. It is often confused with Chardonnay as it is frequently vinified in a similar style, sometimes even using barrel fermentation and malolactic fermentation. It can also be vinified in stainless steel. New World styles of Pinot Blanc can thus range from a bright, crisp, mineral-driven and timid style fermented in stainless steel to a wine resembling a fat, creamy Chardonnay. Do not confuse Pinot Blanc with Pinot Noir Blanc. A white wine can be produced from Pinot Noir if the grapes are pressed without skin contact after harvesting since the pulp and juice of the Pinot Noir grape are clear. The resulting wine is the essence of Pinot Noir grape juice or Pinot Noir Blanc.